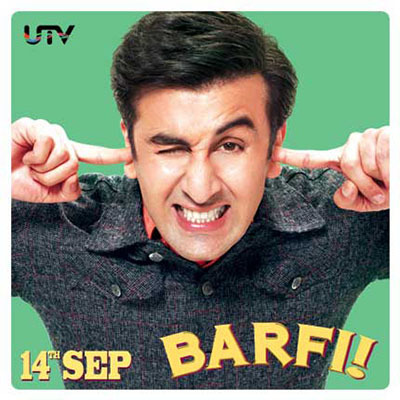 Opinion Poll: Did Barfi! live up to expectations? Ronnie Screwala and Siddharth Roy Kapur have an uncanny knack of straddling between sensible and commercial cinema (7 Khoon Maaf, Udaan, Guzaarish, No One Killed Jessica, Kaminey, Dev D to name a few) and merging them at times to create a lovable film. This brings a lot of production value to Anurag Basu’s Barfi!. Basu, better known for his passionate portrayal of love in various films (Life in a metro, Kites, Murder, Gangster), tries to explore the softer and simpler side of love with Barfi. Ranbir Kapoor and Priyanka Chopra have been talking about Barfi being the most challenging roles they have done. There has been a lot of buzz around the movie before its release so does it live up to it that? Let us first give credit where it is due. If not for the brave new production houses like UTV who produce a Barfi with similar value as a Rowdy Rathore, getting these stories into mainstream Bollywood would have been very difficult. Unlike earlier movies made with subjects like Barfi, it is a full on commercial movie and doesn’t delve deep in portraying the difficulties of life for a deaf and mute Barfi or an autistic Jhilmil. It just goes out and tells the story. Thanks UTV. Barfi is a story of a young man (bereft of hearing and the ability to talk) who falls in love with Shruti, daughter of a rich man who visits Darjeeling often. Then there is an autistic Jhilmil, who inherits a fortune leaving her greedy father to the mercy of a trust. The disappearance of Jhilmil and her friendship with Barfi post his breakup with Shruti forms the key themes in the movie. Somewhere before the intermission a dejected Barfi, moves out of his girlfriend’s house knowing that there was a better “suited” man for her which she and her parents have chosen. There is an emotional outburst neither about being rich nor being “normal” from Barfi there. An umbrella covered Shruti listening to the verbally unsaid outpour of Barfi drenching himself in rain. The sunlight, like other similar scenes, is heavily diffused with dark clouds, colours wilfully cooler and actor intuitively non-melodramatic. A subtle but crackling chemistry between Ranbir Kapoor and Illeana D’ Cruz, great use of ambient light and tones in cinematography, silence punctuated with violins and accordion over a lilting piano tune – the scene more or less summarizes everything that is good about the movie. Contrast this to a scene post intermission, where you see a Jhilmil, feeling jealous and left out while eating at a street side Puchka (Panipuri’s Kolkata version) shop because of Shruti entering their life again. The warm tones of artificial bulbs lighting up the crowded frames of Kolkata (in striking difference to Darjeeling), the infatuation of the earlier life overpowering the lovable present, a socially unaccommodating autistic Jhilmil whose love you cannot completely relate to, a confusion of myriads of emotions – the scene summarizes everything that goes wrong in this well plotted and structurally flawed film. The problem with the structure is that the narrative is complicated and non-linear. There are flashbacks in flashbacks at times and thus it becomes a little difficult to follow - particularly when a suspense ridden thriller narrative is added to a simple and sweet love story. For the love of place and characters, the movie gets over indulgent and too much time is used to develop the relationship between Shruti and Barfi. However, Jhilmil’s character, the key ingredient that is needed to change Barfi’s life and add suspense and thrill to the story is not well introduced to the audience till intermission. The story then rushes through the events in Kolkata without delving deep into the development of Jhilmil’s character and her relationship with Barfi. It tries but doesn’t evoke the same feelings that it could with Shurti. Narrative being a mishmash attempting to be innovative doesn’t help as well. As a result one doesn’t relate as well to Jhilmil and therefore you care less about her disappearance and likewise, the emotional punch of love story between Barfi and Jhilmil is not there due to a lack of chemistry (compared to Barfi and Shruti). Eventually you seem to be caring more for a character who is not the key protagonist. So even if the direction and story by Anurag Basu is polished, the structure of storytelling does not let it come out well. Acting is a highlight. Ranbir Kapoor as Barfi is outstanding. He is successful in slowly creating the charm that is so reminiscent of Rishi Kapoor. The first part of the movie requires him to emote like a Bollywood hero and to perform like a Charlie Chaplin / Mr.Bean – and he does succeed in doing that. Priyanka Chopra tries hard at times but her badly underdeveloped character works against her throughout the film. Illeana D’Cruz looks ravishing and acts her part well. She is surprisingly confident and it is her chemistry with Ranbir Kapoor that adds a different flavour to the movie. Saurabh Shukla, Ashish Vidyarthi, Aakash Khurana – are like old hands one can always rely on. Their acting and performance both are just adequate. It is pleasant to see Rupa Ganguly as Shruti’s mother. She works like a mirror to talk to for Shruti’s character. Ravi Varman, who has been known for using natural light in his cinematography, does an extraordinary job for Barfi as well. Barfi would be a classic example of using tones to add to storytelling. The cool bluish skyline of Kolkata with warm yellow window where Barfi sits, the clear white diffused cool light through mist and clouds of Darjeeling are well captured. The natural light in all scenes is filtered, diffused through windows, clouds, rains, glasses giving the movie a distinct feel. Editing by Akiv Ali also complements the cinematography and story but fails to cover for that basic lacuna created by the structure of storytelling. Also the length of the movie though could have been shortened. Art direction by Rajat Potdar is simply outstanding. Every single item that you see in the frame – whether it is the little mouse in the house or the chau dance props, is used well to enhance the storytelling. Sound design by Shajith Koyeri gives charm to the two main locations shown. Music by Pritam (both the soundtrack and the background score) is very well composed. Background score with a distinct usage of piano, accordion and violin / cello gives a European touch to the montages from Darjeeling. “Ala Barfi” and “Phir Le Aya Dil” in particular are beautifully framed pieces. Shafqat Amanat Ali’s voice takes the latter one to a different level with the added visuals. Overall Barfi has great entertainment value with light hearted charm in the first half. If only the structure of the story was better managed it would have been one of the best family entertainers in years. Fans of Ranbir Kapoor and lovers of offbeat stories will both enjoy the movie equally. UTV, Anurag Basu and Ranbir Kapoor live up to the hype created by the movie but fail to exceed the expectation which they could have done with a great platform like Barfi.